I read a lot of titles. Sometimes it is the description which gets my attention when I see a new book. Other times it is the cover which intrigues me. A combination of both is why I opted to review Incognolio by Micheal Sussman. I received an advance reader electronic copy of the title to facilitate this review. All opinions are my own and Amazon affiliate links are present for your shopping convenience. 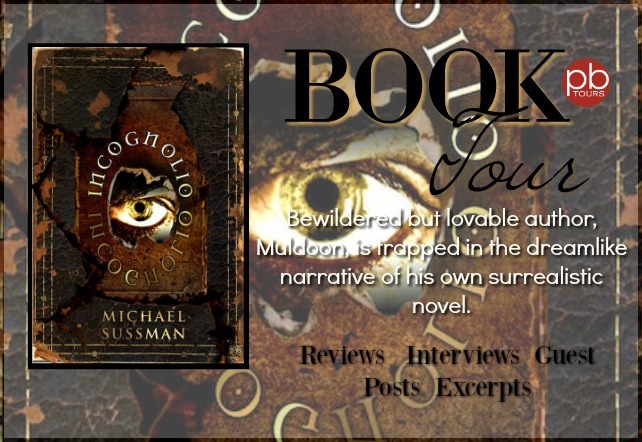 Bewildered but lovable author, Muldoon, is trapped in the dreamlike narrative of his own surrealistic novel. Grab a Copy on Kindle! To say this book is unique compared to many I’ve read would be an understatement. It is like a stream of consciousness spat upon the pages of a book. One minute you are in one line of thought and then instantly you are transported to another reality. Well, more like you do not always know if what is happening is ‘real’ or something the author in the book is typing up for his next novel. If you like your stories well-ordered and following a normal progression, this is NOT a title for you. But, if you like a somewhat strange plot or seemingly lack thereof, then this title may be just up your alley. However, this is not a title which caught my attention and kept me up late at night reading. I needed more brain cells firing while reading to enjoy the ride.